Apart from being of the greatest match finishers in the history of the gentleman’s game, Mahendra Singh Dhoni can safely be termed as a synonym of simplicity. The 37-year-old’s high levels of humility have always stood out as an example and have fetched him a staggering fan base all over the world. And after CSK’s comprehensive victory over KKR on Tuesday, we got another example of the same. Following the win, the team was traveling to Jaipur for their match against Rajasthan Royals. 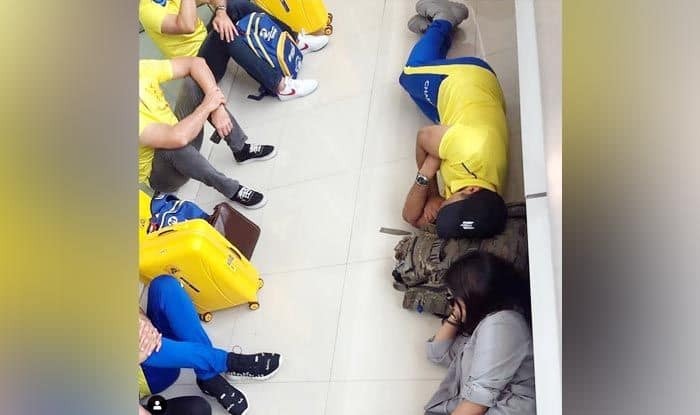 However, Mahi decided to take a refreshing nap at the airport along with his wife Sakshi. But wait. They both decided to sleep on the floor like commoners and share a single bag as their head pillow. Needless to say, his fans got bowled over by their simplicity and showered praise on the couple. That shows dedication and passion. Long tournament and you need to catch up proper rest so that, you will be fully charged for upcoming ICC WC. This man never fails to inspire. We love you, MSD.